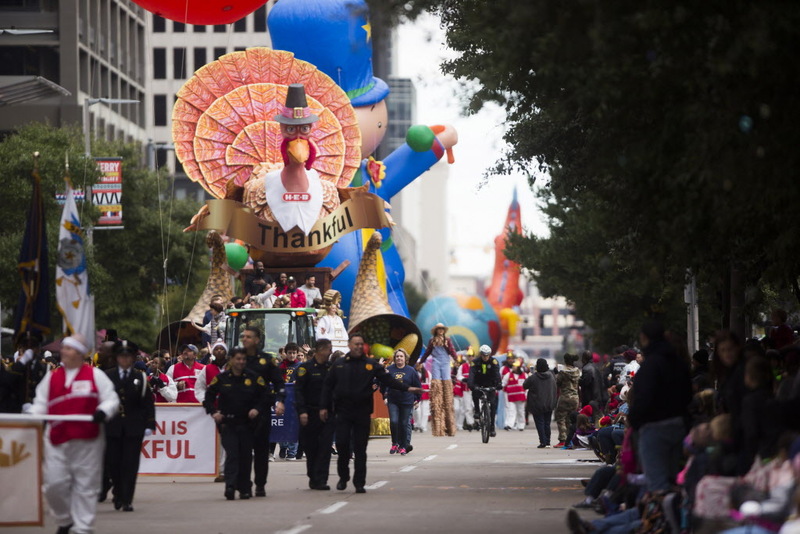 The H-E-B Tom Turkey Float participates on the H-E-B Thanksgiving Day Parade with the parade Grand Marshalls James Harden and Jose Altuve on it, Thursday, Nov. 22, 2018, in Houston. The echoes of marching bands reverberated across downtown Houston Thursday morning as thousands descended to watch the city’s HEB Thanksgiving Day Parade. The parade, which featured prominent Houston athletes such as The Astros ‘Jose Altuve and the Rockets’ James Harden was bolstered this year by a morning of sunshine. Also leading the parade this year were members of Houston’s Southern Apache Museum, which aims to preserve Native American heritage in both the Houston area and in Texas. Mayor Sylvester Turner with other city leaders were on scene to celebrate the 69th year of the parade. Rob Boehlert, a coordinator with the City Wide Club’s annual Big Super Feast event, estimated 20,000 people will enter the convention center’s doors Thursday.